Engraving, Anonymous, 13.8 x 31.6 S, including inscribed margin below (New York, 51.501.667). I. Inscribed: 1542 on the base of the pier just to the right of the center of the composition, and in the margin below: QVO NON PENETRAT. AVT QUID NON EXCOGITAT PIETAS? QVAE IN CARCERE SERVANDI PATRIS NOVAM RATIONEM / INVENIT (Where does not piety penetrate and what does it not invent? Which [piety] finds new understanding in the prison of the father worthy of preservation. )1 followed by a leafy flourish. In this state the wall at the left is without brickwork, and the overall markings on the floor and risers of the steps are missing. II. As in State I but with the wall, floor, and steps completed. III. With short shadows cast downwards by the bars of the window on the wall, just left of center; also inscribed to the right of INVENIT : Ant. Sal. exc. Probably Heinecken, III, 1789, 138, 81, as Bonasone after Polidoro. Bartsch, XV, 1813, 487-488, under no. 2 of doubtful prints by Cesare Reverdino. Herbet, III, 1899, 42 (1969, 130), 24, as Anonymous, after Rosso’s relief in the Gallery of Francis I. COLLECTIONS: Florence, 791ss (I). London, 1874-8-8-329 (II or III, the lower right margin cut, cut also through length of pier right of center and entire right half missing); 1926-10-26-2 (soiled). New York, 17.50.16.140 (I, inscribed margin cut off); 50.501.667 (II). Paris, Aa 175 (II); Ed 3, p.43 top (II), and p.43 bottom (III). Rome, F.C. 71053, vol. 35 H2 (I, inscribed in ink at bottom center: RAPH. VRB. INVENT. ), and F.N. 43247, vol. 20 (III). Kusenberg, 1931, 168, as Anonymous, after Rosso’s relief. De Witt, 1938, 45, no. 791, as Bonasone. Georges Wildenstein, “Le goût pour la peinture dans la bourgeoise parisienne entre 1550 et 1610,” GdBA, 6 série, XXXVIII, 1951, 37, Fig. 28 (III). Zerner, in EdF, 1972, 333, no. 440, as close to the manner of Domenico del Barbiere. Béguin and Pressouyre, 1972, 135, Fig. 200 (III), as Anonymous. Borea, 1980, 261, no. 664, 262, Fig. (I, Florence), as Anonymous. Massari, 1983, 34-35, nos. 5a and 5b, and Figs., as by Giulio Bonasone (and with other bibliography). Carroll, 1987, 44, 260-261, no. 81, with Fig. (New York, I). 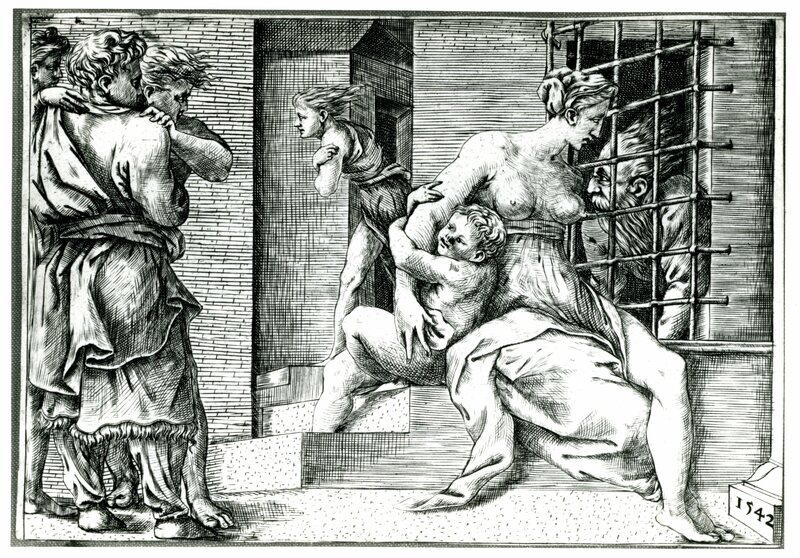 The differences between this print and Rosso’s relief in the same direction under the Cleobis and Biton in the Gallery of Francis I are specified in P.22, V S, where it is suggested that the etcher worked from a lost drawing by Rosso. In the print, which is slightly higher than the relief, the faulty drawing of the top edge of the window, which is parallel to the top of the print rather than in diagonal alignment with the bars in front of the window, would seem to be due to the etcher. 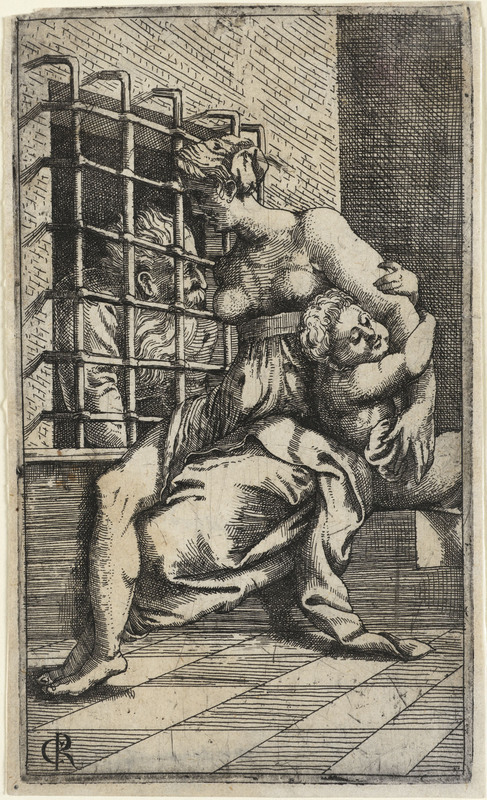 There seems to be no real basis for relating this print to a Cesare Reverdino as suggested by Bartsch. The irregularity of its technique does not suggest Barbiere to me, although Zerner recognized some resemblance. Herbet, IV, 1940, 344 (1969? 191), 3, mentioned Renouvier’s attribution of a print of this subject to Jacques Prévost, but whether or not this engraving is meant has not been determined. Massari’s attribution of the print to Bonasone was already indicated by De Witt and is apparently supported by the other literature that she cites; see also Heinecken, above. PARTIAL COPY, PRINT: See E.144 (Fig.E.144).